In February 2015, IAB and BabyCenter published 2015 State of Modern Motherhood: Mobile and Media in the Lives of Moms, a look at U.S. millennial moms and the central role that mobile plays in the things they buy and the media they watch. We decided to dive back into the data for another look, this time specifically at Hispanic millennial moms, to compare how their use of mobile and media stacks up against the average millennial mom. Unless otherwise noted, references to “moms” throughout this post refer specifically to U.S. moms in the millennial generation, aged 18-32 years old. The Hispanic population is one of the most important demographic groups in the United States today. Among moms this is particularly true: 23 percent of all U.S. births are to Hispanic women. So any marketer looking to reach moms needs to understand Hispanic moms, and tailor their message accordingly, or they risk missing almost one in four of their target audience. The data clearly indicate just how important digital media are for Hispanic moms looking for parenting related advice or insights. Seventy-one percent of Latina millennial moms whose primary language spoken at home is Spanish (going forward, we’ll call these moms “Spanish-preferred,” and we’ll call Hispanic moms whose primary language spoken at home is English, “English-preferred”) seek expert advice on parenting websites weekly or more often, as compared to 60% of moms in that demo who prefer English, and only 49% of moms in general. This holds true for an array of other digital media. Among Spanish-preferred Hispanic moms, 60% turn to mom blogs, 52% turn to other parents on parenting social media, and 45% look to parenting or baby apps, all much higher than the average mom. While the digital world is important for all moms in the coveted millennial age group, it is particularly so for those who are Hispanic. Even more than PC/laptop-based digital, mobile is the key medium for Latina moms. As the table below shows, PC ownership drops for Hispanic moms relative to moms in general, and indeed, the Spanish-preferred segment is almost equally likely to own a tablet as a laptop/PC. Moreover, 36 percent of Latina moms rely on a mobile device (smartphone or tablet) as their sole internet connection—more than 2.1 times the rate of moms overall. Clearly, even more so than for the average millennial mom, Latina moms are already leading mobile-first, and sometimes even mobile-only, lives. As a mobile-first demographic, it’s unsurprising that Hispanic moms spend even more media time on their mobiles than the average mom does. While millennial moms estimate they spend about 2.8 hours daily online via smartphone or tablet, English-preferred Latina moms in that generation spend 3.2 hours, and those who prefer Spanish spend 4 hours online that way. In fact, the latter group spends 37% of their media time with mobile. 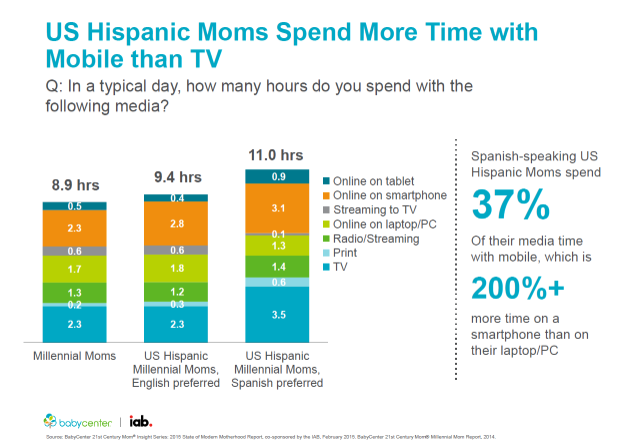 Spanish-preferred Hispanic moms make heavy use of both TV and mobile media, reporting about 11 hours of total daily media time, as compared to 8.9 hours for moms overall. Of course, the only way a busy mom could possibly spend that much time with media is through significant multitasking, and Hispanic moms are true experts at that. About 53 percent of this demo always or often use their smartphones while also watching TV, comparable with moms overall. One area where Hispanic moms are distinctive is in watching online video while watching TV. While 33% of moms overall watch online video on their phones while watching TV, the number jumps to 42% with Latinas. While they have definitely embraced mobile media, Hispanic millennial moms do surprisingly little mobile shopping. For example, 51% of moms overall say they use their mobiles in-store to help them search for better prices, as compared to 42% of English-preferred Hispanic moms, and only 39% of those who prefer Spanish. Similarly, although 62% of moms overall look for and download mobile coupons, only 31% of the Hispanic segment does, and while 44% of U.S. moms search for and read product reviews, and 40% of English-preferred Latina moms do so, and only 27% of those that prefer Spanish use this mobile capability. We think this is a big untapped opportunity for marketers to influence Latina moms’ shopping habits via mobile. This adoption gap would quickly close if Hispanic millennial moms were more aware of such services and capabilities, and if they were more widely available in Spanish. Marketers should not overlook the opportunity to make this demographic more mobile-shopping savvy. In the “2015 State of Modern Motherhood” report, IAB and BabyCenter observed that millennial moms were much more likely than Gen X moms to say they frequently notice digital and mobile ads. That’s even more true of Hispanic millennial moms. Fifty-six percent of them say they frequently notice digital (laptop/PC, smartphone, or tablet) ads, as compared to 44% of millennial moms overall. And over half (52%) of Hispanic moms frequently notice mobile ads, as compared to only 37% of all moms. That is on par with the percentage of Hispanic moms who said they notice TV ads (50%). Clearly, for marketers reaching this important segment of U.S. moms, mobile is a key media channel.